Born in Beardstown Illinois in 1892. Walter and his family moved to Rock Island in 1894 where he later attended Rock Island High School. In 1913 he joined the Independents as an undersized and rarely used end. 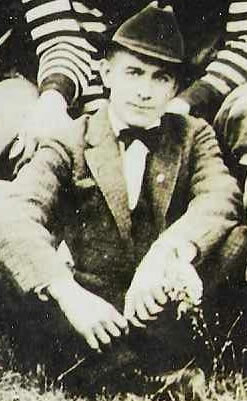 In 1914 manager Jack Roche named Flanigan as his assistant. 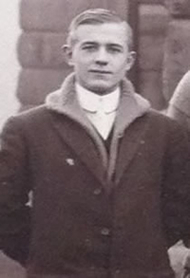 One year later Walter became the manager of the team, a position he held through 1922. Flanigan also served as a desk sargent for the Rock Island police department in 1917. In his 8 years at the helm he took the team from elevated a small neighborhood team to a regional powerhouse. His philosophy of sharing the profits equally with all of the players helped him attract bigger names each year. In 1919 Walter was able to lure Rube Ursella the core of the Minneapolis Marines to play for Rock Island. The team went 9-1-1 while playing several teams from the well known Ohio League. When it came time for professional football to organize the team was invited to join. Flanigan attended the famous Hupmoblie showroom meetings that led to the formation of the NFL. 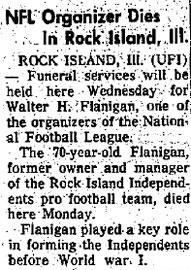 Flanigan represented the Rock Island team and they were one of the charter members. Information was found in various articles in the Rock Island Argus and in articles at the Rock Island Historical Society in 2014.